We have created BackUpTime just for that reason ? to provide you with a way to securely store your most important data. Hey, if you work around computers, you know how often surprises happen. And even when computer works fine, well, then our memory can fail us. Can you easily remember where you placed some memo a year and a half ago? Probably not. But with BackUpTime you will find it in minutes. 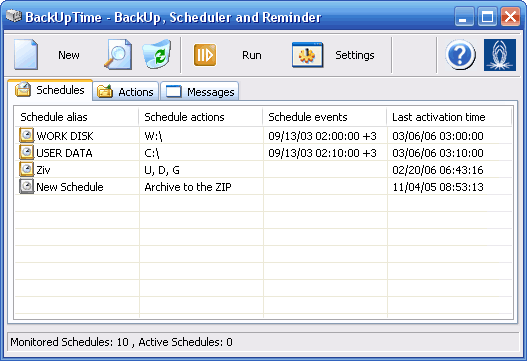 BackUpTime is very Easy in use. Qweas is providing links to BackUpTime 1.7.3741 as a courtesy, and makes no representations regarding BackUpTime or any other applications or any information related thereto. Any questions, complaints or claims regarding this application BackUpTime 1.7.3741 must be directed to the appropriate software vendor. You may click the publisher link of BackUpTime on the top of this page to get more details about the vendor.